(1) Demyelination in the brain and spinal cord. (2) Steroids in optic neuritis and multiple sclerosis. (3) Diagnostic criteria for multiple sclerosis and neuromyelitis optica. (4) The workup of demyelination. Macrophages in a patient with multiple sclerosis. In demyelination there is damage to the myelin, an electrically insulating material composed mainly of lipid that forms a layer around the axons of neurons in the central and peripheral nervous systems. Most demyelination in the brain and spinal cord is inflammatory and occurs as a result of immune-mediated damage. The poster-child for brain and spinal cord inflammatory demyelination is multiple sclerosis, but in working a patient up for this condition one must be wary of mimics such as neuromyelitis optica and acute disseminated encephalomyelitis, as the treatments are vastly different. Demyelination may either be inflammatory (multiple sclerosis, neuromyelitis optica, acute disseminated encephalomyelitis, and progressive multifocal leukoencephalopathy) or non-inflammatory (rare conditions such as central pontine myelinolysis). - In multiple sclerosis, inflammatory T cell-mediated damage occurs to the myelin in the brain and spinal cord. Initially, the inflammation is transient and remyelination leads to clinical recovery, but the new myelin is not durable and so over time, extensive and chronic neurodegeneration occurs (Compston and Coles, 2008). The clinical correlate of this neurodegeneration is the progressive accumulation of disability. - Patients present with any of optic neuritis, a cerebellar or brainstem syndrome, a spinal cord syndrome, or occasionally cerebral hemisphere dysfunction (Marcus et al, 2013). One sign considered "classic" for multiple sclerosis is Lhermitte's sign, an electrical sensation often elicited by bending the head forward that runs down the back and into the limbs. It is actually not that classic, as it can occur in many other conditions. - With regards to first presentation, 80% of patients eventually diagnosed with multiple sclerosis present with one episode of demyelination called a clinically isolated syndrome. If an MRI at the time shows no other lesions, the chance of a second episode by two years is 50% (Compston and Coles, 2008) and the chance of being diagnosed with clinically definite multiple sclerosis by ten years is 20% (Marcus et al, 2013). If the MRI shows additional clinically asymptomatic white-matter lesions, the chance of a second episode by two years is 80% (Compston and Coles, 2008) and the chance of being diagnosed with clinically definite multiple sclerosis by ten years is also about 80% (Marcus et al, 2013). - With regards to clinical course, roughly 80% of patients eventually diagnosed with multiple sclerosis have a relapsing-remitting course (a relapse followed by full recovery and months or years of quiescence), although after twenty years or so most of these patients will develop a secondary progressive course (progressive neurological decline between relapses without full recovery). Roughly 10-20% of patients eventually diagnosed with multiple sclerosis have a primary progressive course (no remission after the initial symptoms). The remainder have a progressive relapsing course (steady neurological decline with superimposed relapses) (Compston and Coles, 2008). - The presence of incidental MRI findings highly suggestive of multiple sclerosis in asymptomatic patients is called a radiologically isolated syndrome and 33% of these patients will go on to develop either a clinically isolated syndrome or multiple sclerosis (Okuda et al, 2009). - Diagnosis is made using the revised McDonald criteria. - In neuromyelitis optica (also known as Devic's disease), there is inflammatory B cell antibody-mediated damage to aquaporin-4, a protein found in astrocyte membranes that acts as a channel for water transport across the cell membrane. Demyelination occurs primarily in the spinal cord and optic nerves. - Patients present with myelitis (spinal cord inflammation) on MRI that primarily involves the central part of the cord and extends over three or more spinal segments, severe bilateral optic neuritis showing a swollen optic nerve, optic chiasm lesion (where the optic nerves cross), or altitudinal scotoma (an area of altered vision above or below the horizontal), and intractable hiccups, nausea, or vomiting present for at least two days as result of medulla involvement with a periaqueductal medullary lesion seen on MRI (Polman et al, 2011). - With regards to clinical course, roughly 85% of patients have a relapsing course with disabilities arising after each relapse. NMO seropositivity is particularly predictive of a relapsing disease course (Jacob et al, 2013). - Diagnosis is made using the Mayo criteria. (3) Acute disseminated encephalomyelitis (ADEM). - In ADEM, there is an immune-mediated inflammatory response to a viral infection, or less commonly a vaccination, bacterial infection, or parasitic infection. This results in inflammatory lesions in the brain (particularly the white matter) and spinal cord. - Patients present with headache, fever, drowsiness, seizures, and coma one to three weeks after the infection or vaccination. The symptoms are mild at first but worsen over hours to days, with the mean time to maximum severity being four to five days (Tenembaum, 2002). - Typically runs a monophasic clinical course. - Diagnosis is based on the rapidity of clinical decline plus typical MRI findings which include a diffuse bilateral lesion pattern, the absence of "black holes" (T1 hypointensities indicative of extensive tissue loss), and the absence of two or more periventricular lesions (Callen, 2009). (4) Progressive multifocal leuloencephalopathy (PML). - In PML, reactivation of the JC virus results in progressive inflammation of the white matter of the brain at multiple locations. This occurs almost exclusively in people with immunodeficiency - about half of the general population is seropositive for the JC virus, indicating past or present infection, but a healthy immune system easily keeps the virus in check (Egli et al, 2009). The activated JC virus destroys oligodendrocytes. - Patients present with weakness, vision loss, impaired speech, and cognitive deterioration. - Diagnosis is based on MRI findings and lumbar puncture. Cerebrospinal fluid PCR of the JC virus is 74-93% sensitive and 92-99% specific for PML (Bossolasco et al, 2005). - In central pontine myelinolysis, the most common etiology is from correcting sodium levels too quickly in patients with chronic, severe hyponatremia. The neurons and glia in these people have adapted to the chronically low sodium levels and need a bit of time to adapt to corrective changes, which should be no more than 8-10 mmol/L per day. When corrected too quickly, water is driven out of the neurons and glia, leading to cell dysfunction and demyelination in the pons and occasionally surrounding structures as well. The other etiologies include alcoholism, liver disease, and malnutrition. - Patients present with acute paralysis, dysphagia, and dysarthria. - Diagnosis is based on a supportive history of hyponatremia correction plus noninflammatory pontine demyelination seen on MRI. The first MRI may be normal (Graff-Radford et al, 2011). In at least 10% of patients, demyelination also occurs in extrapontine regions, including the midbrain, thalamus, basal nuclei, or cerebellum (Lampl and Yazdi, 2002). Whether there is a known underlying condition or not, demyelination in the brain and spinal cord often presents as either optic neuritis or an "attack" elsewhere in the body. The best way to treat optic neuritis and multiple sclerosis attacks is controversial. Part of the controversy relates to whether steroids are useful in acute optic neuritis. The Optic Neuritis Treatment Trial (ONTT), a multi-centered randomized trial involving 457 patients, assessed patients with clinically diagnosed unilateral optic neuritis with eight days or less of visual loss and no other systemic disease except multiple sclerosis as the source of optic neuritis (Beck et al, 1992). The trial compared two weeks of high-dose intravenous methylprednisolone, low-dose oral prednisolone, and placebo and found that high-dose intravenous methylprednisolone hastened vision recovery within one month but by one year there was no significant difference in visual outcomes between any of the groups. Strangely, the group with the low-dose oral prednisolone had more recurrent optic neuritis for reasons that remain unknown. The lack of long-term effect on visual outcome was corroborated by a systematic review including six trials with a total of 750 patients that concluded no benefit for either intravenous or oral steroids on long-term visual outcomes (Gal et al, 2012). However, it should be noted that most of the patients in this review came from the ONTT trial. The single, glaring problem with the ONTT trial (and hence the subsequent systematic review as well) is that the mean duration of visual symptoms before commencing treatment was five days and therefore all the ONTT trial really showed was that five days is probably too late to make any meaningful difference to long-term visual outcomes in acute optic neuritis. Thus, the question as to whether high-dose steroids are useful in acute optic neuritis remains open, although it would seem reasonable to treat any patient within five days of developing visual symptoms consistent with acute optic neuritis since no harm will be done and visual recovery will be hastened. Part of the controversy also relates to whether steroids are indicated for acute multiple sclerosis attacks in general, not just optic neuritis. One small but reasonably solid double-blind randomized trial involving 51 patients compared high-dose oral steroid therapy with placebo and found that more than twice as many patients experienced significant improvements in disability scores in the treated group by one, three, and eight weeks of treatment (Sellebjerg et al, 1998). The mean duration to treatment time was rather lengthy at 12 days after the start of the attack for the oral steroid group and 15 days for the placebo group, suggesting that even with a significant delay high-dose oral steroids are beneficial to hastening recovery. Moreover, this study complements the ONTT trial results by demonstrating that high-dose steroids hasten recovery in multiple sclerosis attacks in general. Furthermore, it shows that high-dose oral steroids may be beneficial. There are other reasonably well-conducted studies that examine the intravenous versus oral steroid question, such as a randomized controlled trial involving 80 patients that demonstrated that both high-dose intravenous and low-dose oral steroids improve disability scores in patients with acute multiple sclerosis attacks to similar degrees up to six months after the onset of treatment (Barnes et al, 1997). Thus, high-dose intravenous and high-dose oral steroids both appear to be effective in treating multiple sclerosis attacks. However, this conclusion should be taken with a grain of salt as although the supportive trials were randomized, they involved rather small numbers of patients. If this is not possible, oral alternatives include prednisolone 1250 mg daily or dexamethasone 200 mg daily for three to five days. It is essential to differentiate between multiple sclerosis and neuromyelitis optica. (1) Multiple sclerosis and the revised McDonald criteria. - By far the most common demyelinating disorder encountered in a hospital is multiple sclerosis. Since diagnosing multiple sclerosis can be tricky, a well-defined set of criteria called the revised McDonald criteria have been established to facilitate the early and confident detection of this condition. In the revised McDonald criteria, the history and examination findings remain paramount, but MRI imaging plays an essential supportive role. In fact, the question of demyelination is often raised by a radiologist reporting an MRI scan that has no clinical correlate, the so-called radiologically isolated syndrome (Okuda et al, 2009). Although this syndrome is intriguing, a clinical impact is still required to make the diagnosis and so the revised McDonald criteria define multiple sclerosis clinically and radiologically. It could be argued that it would be even better to define multiple sclerosis by its pathological presence, but in practice this would be hard to do as it would require an invasive biopsy. Thus, the revised McDonald criteria remain the current gold standard for the diagnosis of multiple sclerosis (Polman et al, 2011). They require dissemination in space and time. - Further tests include visual evoked potentials (VEPs) and lumbar puncture. VEPs can be useful if optic neuritis is suspected but not clinically proven. - Cerebrospinal fluid findings of >50 white cells or protein >100 mg/dL are rare in multiple sclerosis (Marcus et al, 2013). Notably, assessing the cerebrospinal fluid for oligoclonal bands (protein fragments secreted by plasma cells; the presence of oligoclonal bands in cerebrospinal fluid combined with their absence in the blood indicates that they are produced within the central nervous system) is no longer a routine test when investigating suspected multiple sclerosis. The combination of clinical and radiological findings, as outlined by the McDonald criteria, is good enough. Moreover, oligoclonal bands unique to the cerebrospinal fluid are not specific to multiple sclerosis - they occur in many other conditions such as Sjogren's syndrome, neurosarcoidosis, systemic lupus erythematosus, HIV, meningitis, and encephalitis, to name but a few. That all being said, the presence of at least two oligoclonal bands in the cerebrospinal fluid of a patient with a clinically isolated syndrome is 91% sensitive and 94% specific for the development of relapsing-remitting multiple sclerosis (Marcus, 2013), and so lumbar puncture could still be useful if doubt regarding the diagnosis still lingers, or to exclude demyelinating mimics or cerebrospinal fluid infections if considered within the differential (Polman et al, 2011). Sagittal FLAIR MRI image of the brain of a patient with multiple sclerosis for at least thirty years. Note the areas of hyperintensity (white in colour) extending out from the lateral ventricle (black in colour). These are periventricular areas of demyelination. (2) Neuromyelitis optica and the Mayo criteria. - One of the demyelinating mimics of multiple sclerosis is neuromyelitis optica, especially in female patients of Asian or South American ethnicity. A separate set of Mayo criteria exist for neuromyelitis optica (Wingerchuk et al, 2006). - It is noteworthy that 60% of patients still develop brain MRI abnormalities (Pittock et al, 2006). - The lumbar puncture in neuromyelitis optica may show a high white cell count of >50 white cells (Wingerchuk et al, 2003). Serum aquaporin-4 antibodies are 73% sensitive and 91% specific for neuromyelitis optica (Lennon et al, 2004). Testing for aquaporin-4 antibodies in the cerebrospinal fluid does not increase the sensitivity or specificity of the diagnostic criteria for neuromyelitis optica (Jarius et al, 2010) but might be useful if a high index of suspicion remains despite negative serological evaluation (Jacob et al, 2013). - There are many differentials for longitudinally extensive spinal cord lesions including multiple sclerosis, neuromyelitis optica (ring of Sauron sign), MOG (ADEM-like brain lesions), sarcoidosis (linear enhancement, trident sign), Behcet's (hypointense core with enhancing ring, prefers T5/6), lymphoma, metastases (flame sign), paraneoplastic (lateral columns enhance), meningoencephalitis, infarct (owl's eyes), arteriovenous fistula (thoracic), compression (pancake band enhancement), and tractopathy (lateral and/or dorsal columns enhance - think copper, B12, toxic, mitochondrial, syphilis, HIV). Sagittal T2 MRI image of the cervical spine in a patient with symptoms of neuromyelitis optica lasting nearly a decade, although she was diagnosed much later on. Note the long area of hyperintensity (white in colour) running along most of the spinal cord (dark grey in colour). This is an impressively long segment of demyelination. MRI brain and spine (with T1/T2/FLAIR/gadolinium). Consider lumbar puncture (glucose, protein, cell count, protein electrophoresis, Igs, OCBs, ACE, TB). Consider bloods (for mimics OCBs, NMO. MOG, protein, ACE, TB, for immunomodulation add HIV, VDRL, Hep B/C, VZV, JCV). For all, do FBC, electrolytes, Cr, LFTs, CXR, QFG, Hep B surface antigen, Hep C antibody, HIV, VZV antibodies, and urinalysis. If intend to use fingolimod, dimethyl fumarate, or natalizumab, add JC virus antibody. ​If intend to use fingolimod, OCT and ophthalmology review. If intend to use azathioprine, add TPMT. Immunomodulation alters the course of inflammatory brain and spinal cord demyelination. There are many immunomodulatory options for relapsing-remitting multiple sclerosis, supported by a variety of studies involving large numbers of patients. The correct treatment strategies for neuromyelitis optica and ADEM, on the other hand, are much more vague as there are only a handful of small studies available to help guide treatment decisions. - Immunomodulatory therapy reduces the frequency and severity of relapses as well as the lesion load in the brain and spinal cord. - For fingolimod, aim for a lymphocyte count 0.2 or higher and for dimethyl fumarate, aim for a lymphocyte count 0.6 or higher. - Regarding alemtuzumab, it is a major undertaking. It should be used in severe natalizumab allergy or over two years on natalizumab with JC>1.5. The alternative is to use natalizumab 6-8 weekly with MRIs 4-6 monthly to look for PML. - For an acute attack, initiate methylprednisolone 1 g iv daily for three to five days followed by prednisolone 1 mg/kg for one month (Jacob et al, 2013). If the deficit is severe and no recovery is seen by the second week, initiate plasma exchange (PLEX). - If seropositive, continue prednisolone 1 mg/kg and add further immunosuppression with any of azathioprine 1-1.5 mg/kg bd, mycophenolate 1 g bd, cyclosporine 100-150 mg bd, or methotrexate 10-20 mg weekly (provide folate 5 mg daily). Taper the prednisolone down to 10-20 mg alternate daily. - If seronegative, continue prednisolone 1 mg/kg for one month and then gradually taper over six months (Jacob et al, 2013). - If the condition is refractory to the above regimes, commence rituximab 1 g iv on day 1 and day 14 repeated every six months (Jacobs et al, 2013). - Manage tonic spasms with carbamazepine 100-200 mg bd. - Initiate methylprednisolone 1 g iv daily for three to five days. If this fails, initiate intravenous immunoglobulin (IVIg) 2 g/kg over three to five days. - Stop all immunosuppression. Consider initiating PLEX. Watch for the immune reconstitution inflammatory syndrome two to six weeks later. If this occurs, consider high-dose steroids. Here is a synopsis of multiple sclerosis treatment. Steroids in optic neuritis and multiple sclerosis attacks. Commence immunomodulation after one month. Followup (full blood count, electrolytes, liver functions, and urinalysis at months 2/4/6/12; for Gilenya, optical coherence tomography at month 4). Treat spasticity with baclofen 5 mg tds (up to 30 mg tds), increase by 5 mg tds every three days. Demyelination in the brain and spinal cord is longer the proclamation of doom that it may have once been. There are now a myriad of multiple sclerosis therapies available, with fingolimod (Gilenya) and dimethy fumarate (Tecfidera) standing above the rest. Unlike some of the older immunomodulatory therapies, each of these two oral tablets has the ability to cut relapse rates down by more than half, and both have an acceptable side-effect profile. These medications are important, as an untreated patient with multiple sclerosis has a 50% lifetime risk of depression (Minden and Schiffer, 1990) and a life expectancy five to ten years lower compared to an unaffected person (Bronnum-Hansen, 2004). While there may not be as many therapeutic options available for neuromyelitis optica, the combination of prednisolone with azathioprine appears to be quite effective. Left untreated for five years, half of all patients with neuromyelitis optica will lose their sight in one eye or be unable to walk without an aid, and approximately one third will die (Wingerchuk et al, 1999). With respect to acute disseminated encephalomyelitis, the natural course is unknown but with treatment the prognosis is good, with roughly 60-80% making a complete recovery (Dale and Branson, 2005). Barnes et al. 1997. Randomised trial of oral and intravenous methylprednisolone in acute relapses of multiple sclerosis. The Lancet 349(9056), 902-906. Beck et al. 1992. A Randomized, controlled trial of corticosteroids in the treatment of acute optic neuritis. New England Journal of Medicine 326, 581-588. Bossolasco et al. 2005. Prognostic significance of JC virus DNA levels of cereberospinal fluid in patients with HIV-associated progressive multifocal leukoencephalopathy. Clinical Infectious Diseases 40(5), 738-744. Bronnum-Hansen et al. 2004. Trends in survival and cause of death in Danish patients with multiple sclerosis. Brain 127, 844-850. Callen et al. 2009. Role of MRI in the differentiation of children of ADEM from MS in children. Neurology 72(11), 968-973. Compston and Coles. 2008. Multiple sclerosis. Lancet 372(9648), 1502-1517. Dale and Branson. 2005. Acute disseminated encephalomyelitis or multiple sclerosis: can the initial presentation help in establishing a correct diagnosis? Archives of Disease in Childhood 90(6), 636-639. Egli et al. 2009. Prevalence of polyomavirus BK and JC infection and replication in 400 healthy blood donors. The Journal of Infectious Diseases 199(6), 837-846. Gal et al. 2012. Corticosteroids for treating optic neuritis. The Cochran Database of Systematic Reviews 18(4), CD001430. Gold et al. 2012. Placebo-controlled phase 3 study of oral BG-12 for relapsing multiple sclerosis. New England Journal of Medicine 367(24), 2362. Graff-Radford et al. 2011. Clinical and radiological correlations of central pontine myelinolysis syndrome. Mayo Clinic Proceedings 86(11), 1063-1067. Jacob et al. 2013. Current concept of neuromyelitis optica (NMO) and NMO spectrum disorders. Journal of Neurology, Neurosurgery, and Psychiatry 84, 922-930. Jacobs et al. 1996. Intramuscular interferon beta-1a for disease progression in relapsing multiple sclerosis. Annals of Neurology 39(3), 285-294. Jarius et al. 2010. Cerebrospinal fluid antibodies to aquaporin-4 in neuromyelitis optica and related disorders: frequency, origin, and diagnostic relevance. Journal of Neuroinflammation 7(58). Johnson et al. 1995. Copolymer 1 reduces relapse rate and improves disability in relapsing-remitting multiple sclerosis: results of a phase III multicenter, double-blind placebo-controlled trial. Neurology 45(7), 1268-1276. Kappos et al. 2010. A placebo-controlled trial of oral fingolimod in relapsing multiple sclerosis. New England Journal of Medicine 362, 387-401. Lampl and Yazdi. 2002. Central pontine myelinolysis. European Neurology 47(1), 3-10. Lennon et al. 2004. A serum autoantibody marker of neuromyelitis optica: distinction from multiple sclerosis. Lancet 364, 2106-2112. Marcus et al. 2013. Updates on clinically isolated syndrome and diagnostic criteria for multiple sclerosis. Neurohospitalist 3(2), 65-80. Minden and Schiffer. 1990. Affective disorders in multiple sclerosis. Review and recommendations for clinical research. Archives of Neurology 47, 98-104. O'Connor et al. 2011. 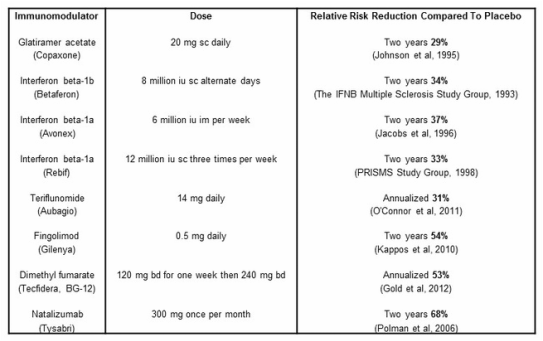 Randomized trial of oral teriflunomide for relapsing multiple sclerosis. The New England Journal of Medicine 365, 1293-1303. Okuda et al. 2009. Incidental MRI anomalies suggestive of multiple sclerosis. Neurology 72(9), 800-805. Pittock et al. 2006. Brain abnormalities in neuromyelitis optica. Archives of Neurology 63, 390-396. Polman et al. 2006. A randomized, placebo-controlled trial of natalizumab for relapsing multiple sclerosis. The New England Journal of Medicine 354, 899-910. Polman et al. 2011. Diagnostic criteria for multiple sclerosis: 2010 revisions to the McDonald criteria. Annals of Neurology 69(2), 292-302. PRISMS Study Group. 1998. Randomised double-blind placebo-controlled study of interferon beta-1a in relapsing/remitting multiple sclerosis. Lancet 352(9139), 1498-1504. Sellebjerg et al. 1998. Double-blind, randomized, placebo-controlled study of oral, high-dose methylprednisolone in attacks of MS. Neurology 51(2), 529-534. Tenembaum. 2002. Acute disseminated encephalomyelitis: a long-term follow up study of 84 pediatric patients. Neurology 59(8), 1224-1231. The IFNB Multiple Sclerosis Study Group. 1993. Interferon beta-1b is effective in relapsing-remitting multiple sclerosis. Clinical results of a multicenter, randomized, double-blind, placebo-controlled trial. Neurology 43(4), 655-661. Wingerchuk et al. 1999. The clinical course of neuromyelitis optica (Devic's syndrome). Neurology 53(5), 1107-1114. Wingerchuk et al. 2003. Neuromyelitis optica: clinical predictors of a relapsing course and survival. Neurology 60(5), 848-853. Wingerchuk et al. 2006. Revised diagnostic criteria for neuromyelitis optica. Neurology 66(10), 1485-1489.